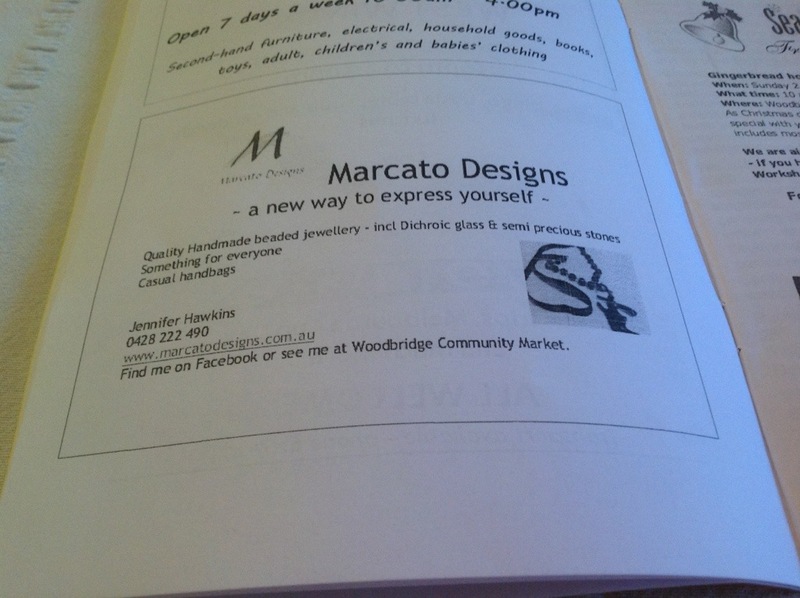 The Westwinds newsletter came out yesterday and I frantically flicked the pages to find my ad. There it was! A good size, half page, with plenty of space around, but the email I sent transferred into smaller printing, so should I take an ad out in next months I’ll ask them to maybe up the size a point or two. Even if I only get a couple of responses it will have done its job. Of course it would be great to have an avalanche of people, but I take the realistic approach to these things. On an aside, mum is heading to her Quilters meeting on Saturday which includes a Christmassy trade tables and is taking my Christmas earrings. Again, realistically, I’m not expecting a huge response, even if only a couple sold I would be happy. (If I had to I would, but it would not be ideal to be making more earrings on Sat night for Sundays market). This entry was posted in Misc craft posts and tagged advertising, Christmas, earrings, Facebook, markets, meeting, newsletter, quilters, trade table. Bookmark the permalink.